(I may or may not be serious) Anyone else wondering why the Rebellion is keeping Han and Luke around? I mean, those two are like walking liabilities. I get that maybe the Rebellion isn't in a position to be choosy, but I feel a line has to be drawn somewhere. If I was in charge, I'd be sending them a 'Thanks, but no thanks' memo. 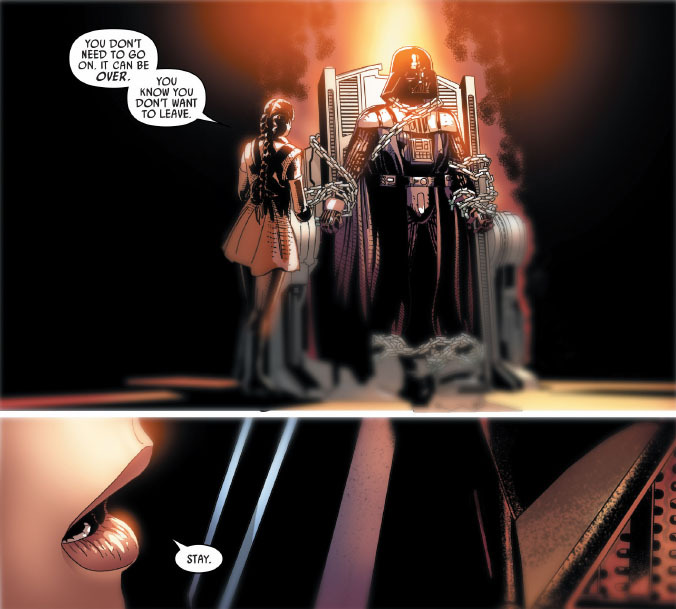 I'm curious to see how Aphra's gonna handle learning that Vader wants her dead. Wonder if she'll throw her lot in with the Rebellion. I'm sure they could use a droid specialist. Maybe Leia and the resistance will track Doctor Aphra (they mentioned how they've placed trackers on her) and they'll reach just in time to save her from Vader? I'd love to see her join the resistance and cause lots of trouble for the imperials.....the resistance could use a droid specialist but would Bee Tee and 0-0-0 join the resistance or remain with the imperials? 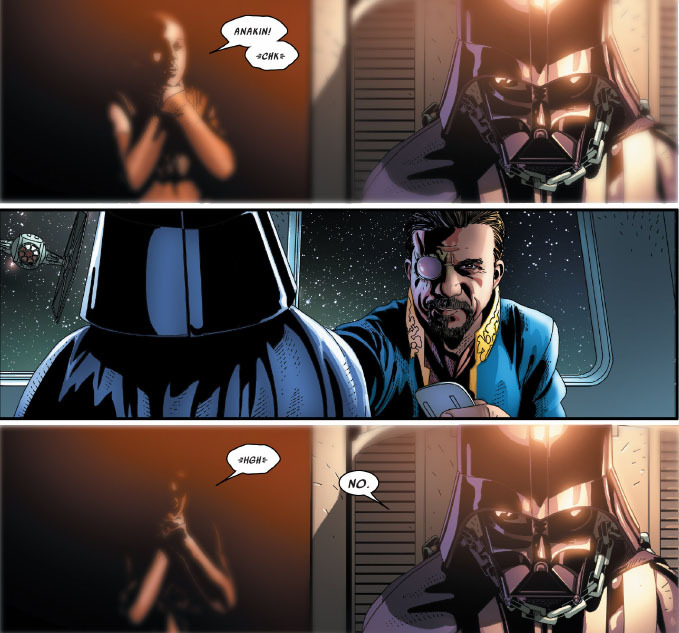 But I also have a bad feeling Vader might finish her off.....in the first Vader comics, she tells Vader that if he must kill her, she requested it be done quickly with a lightsaber through the neck....could it be foreshadowing? 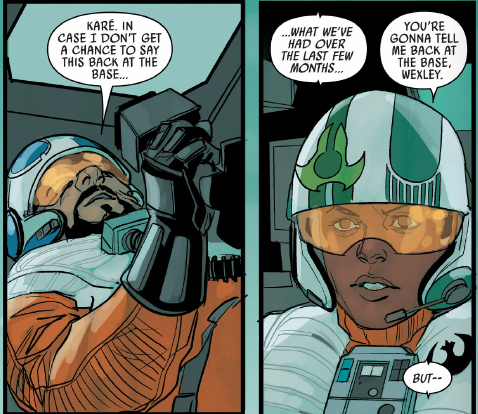 Poe Dameron Issue #3 is out.... are we seeing the first official romantic couple of the ST? 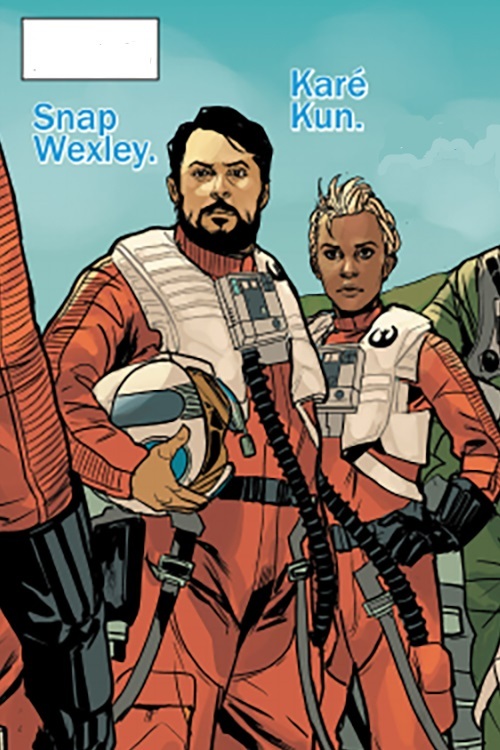 The first of the four-part comic series of "The Force Awakens" is finally out and I'm a little disappointed.... the first page was really weird, particularly how the characters are introduced. I'll probably get the rest to complete the collection but I'm not a fan so far! 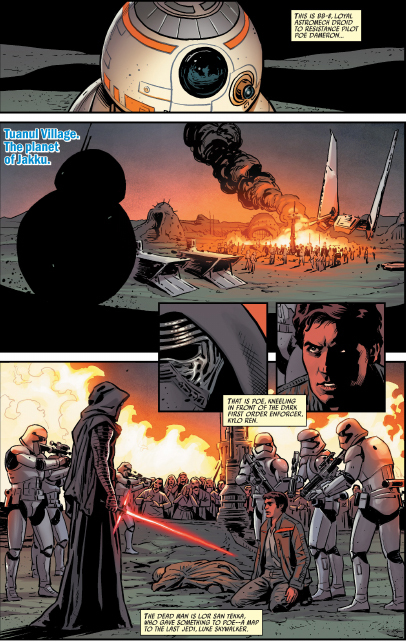 @panki wrote: The first of the four-part comic series of "The Force Awakens" is finally out and I'm a little disappointed.... the first page was really weird, particularly how the characters are introduced. I have to wait until September . I've read reviews, they weren't really positive. I've just finished the Leia mini-series and was also a bit dissappointed (lame story and the illustrations were not really convincing). But I loved Obi-Wan and Anakin! Obiwan & Anakin was really good! 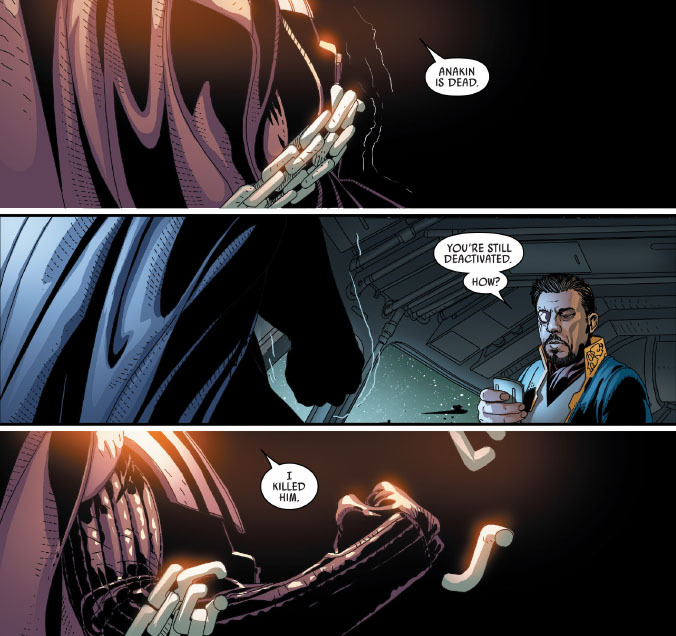 Sometimes I wonder whether Lor San Tekka would have been able to tell the difference between jedi and sith knowledge/ artifacts after reading of how the Scavenger mistook sith artifacts for jedi ones (which Obi-wan wisely figured out)....maybe he inadvertently passed dark side knowledge to Luke and his acolytes? Oh my goodness... looks like the artwork still hasn't improved. The first issue was awful! Poe looked like he was in his sixties LOL! Oh well, looking forward to seeing the Reylo interactions anyway. Hey Panki, did you ever read the Obsession comics? Anyone seen the latest issue of the Journal of Ben Kenobi? Holy crap, Owen and Beru are kinda awesome. Whoo! Silly question I know, of course you would have lol . 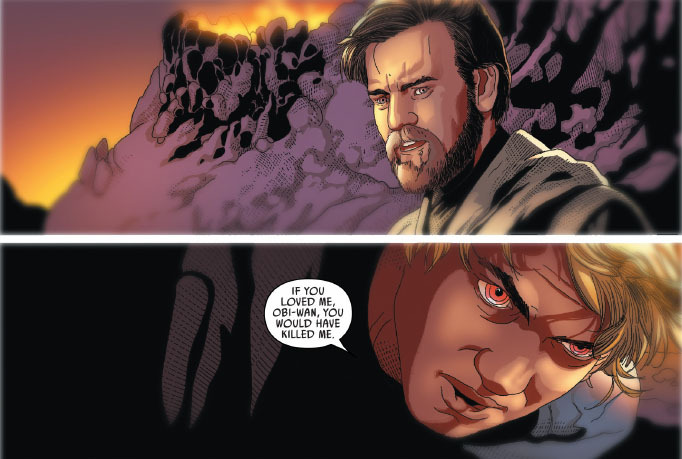 I'm gonna be honest, I was really disappointed that the Obi-Wan/Asajj relationship wasn't brought into canon - specifically the 2008 Clone Wars. 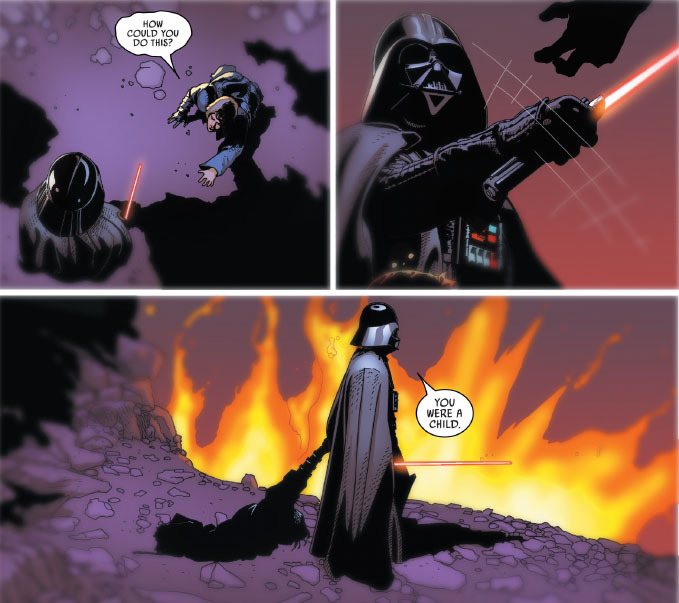 There were hints of it here and there but it wasn't fully explored, but the relationship was so intense and engaging with ambiguity in it as in you never never really sure what their true feelings for each other were and in my opinion it fitted with the whole redemption theme of SW as well as the hero/villain romance themes. Still I haven't seen all of Clone Wars so I don't know the full extent of the Obi-Wan/Satine relationship and I haven't read Dark Disciple either (that's on my reading list lol). I also loved how they brought Durge back and he got better development in it then the 2003 Clone Wars. Do you think he'll ever come back into canon? It is funny....when someone in the old forum told me that Ventress was now Vos's LI in canon, I was really outraged because I loved the Obi-wan and Ventress relationship in SW Republic and Obsession....then I read Dark Disciple and fell completely in love with the Vos-Ventress relationship (wept buckets at the end of the book- it is possibly one of the best books in canon) and I just cannot imagine it any other way...if I look at it objectively, I think it is because the EU Ventress is not the same as the canon Ventress.....I read somewhere that GL liked her character but didn't want her to be a sith...so she has actually ended up being a much sweeter character and a Nightsister in canon- more grey than dark....helping Ahsoka, saving that kidnapped alien girl, etc....now that I think about it, this iteration of Ventress is a combination of Vos's EU LIs- Shylar and Khaleen....while the EU Ventress personality was used for the Seventh Sister in Rebels down to the little crustacean robots she uses to find things. Another possibility for this development is that the Obi-wan- Ventress relationship would undermine the Obi-wan-Satine relationship- making him hop from LI to LI....I don't know if you've seen any of the Clone Wars episodes about the Mandalorians, but Satine reminds me of a non-FS Siri Tachi....so I like her. I haven't had a chance to see the old clone wars cartoon as yet...but I like Durge in the comics....maybe they'll bring him into Rebels and make him work for Vader since he used bounty hunters? @Armadeus wrote: Anyone seen the latest issue of the Journal of Ben Kenobi? 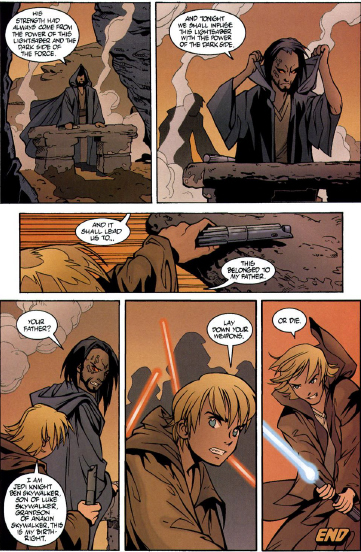 Uncle Owen's attempts to bond with Luke are especially touching...and I like how he winks at Obi-wan at the end of the story....that was really nice. 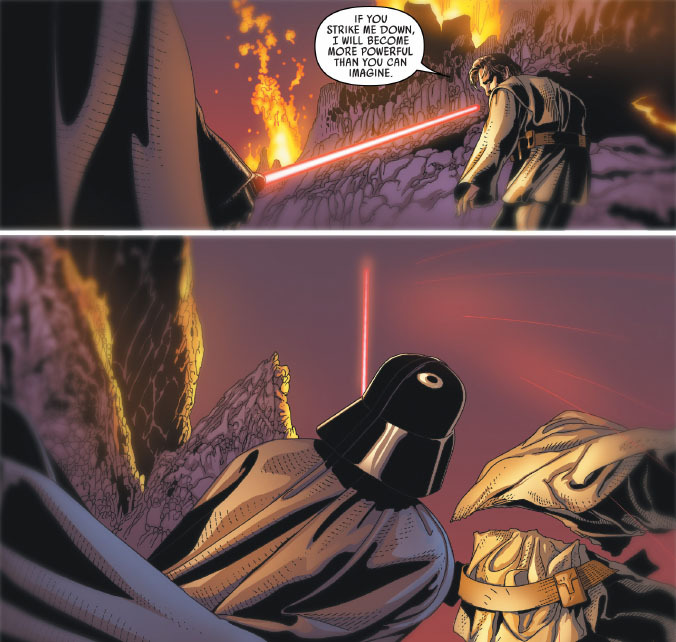 What did you think of Obi-wan, Owen and Black Krrsantan's fight? 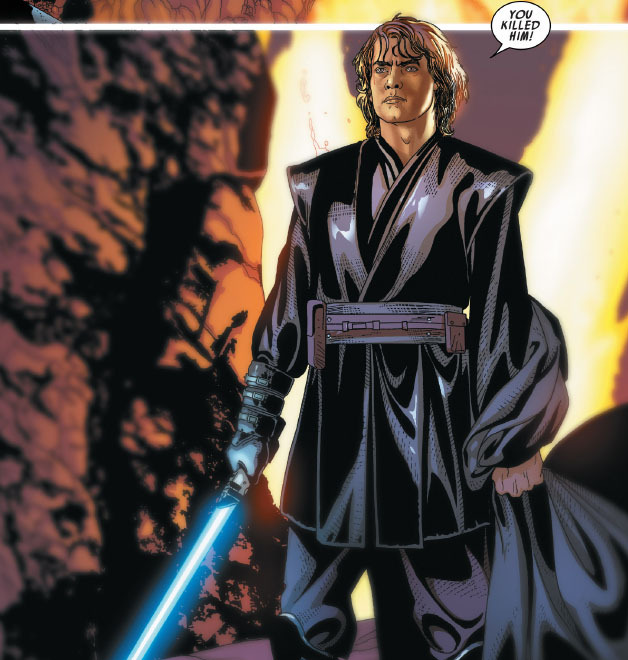 I thought it was beautifully illustrated....actually, all the Old Man Kenobi comics have some of the best artwork. 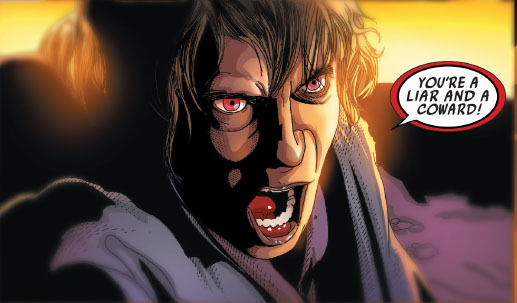 Star Wars Annual 2 will be available in January 2017 and is supposed to cover Leia's adventures as a rebel spy....I've noticed that there are a lot of stories in canon pertaining to Leia either as a spy or managing a spy ring, including sending Han on dangerous missions.... could this foreshadow Ben Solo initially contacting the FO as a spy for Leia? Wow, how many comics are out there? 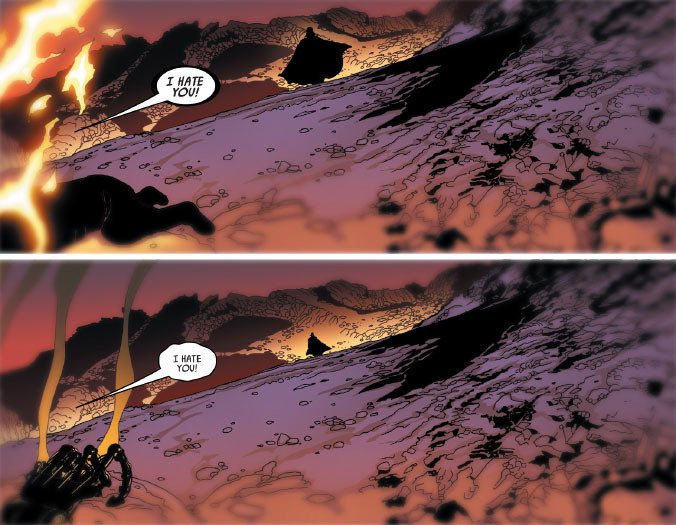 My problem with comics is it reads so quickly and then I am like "That's it? Where is the rest of it?" And then I don't feel like filling my cupboards with comics. I tried the electronic ones - Mad Max not SW - on my iPad but it's not the same. So I prefer the novels. However, I would really love it if they would put drawings of the characters in the novels. Sometimes they describe a specy and I still have a hard time picturing it in my head. So I'd need something in between comics and novels I did buy a Leia comic a couple of weeks ago in the US but it was more as a souvenir. Have not read it yet. I finished A New Dawn. I am still in the middle of Aftermath - Life Debt. Unfortunately I kind of started the 2 novels in parallel but was more interested in finishing A New Dawn. Now that I am back to Life Debt, I have to readjust to the story. I must admit I tend to forget names. Now if there was a picture with the name, I'd remember better. I will be relying on you @panki before buying the TFA comics. If there is anything annoying in terms of how the characters and their dynamic are described in the last 2 issues, I won't buy it. I still clench my teeth thinking about the novelizations. @SanghaRen wrote: Wow, how many comics are out there? My problem with comics is it reads so quickly and then I am like "That's it? Where is the rest of it?" And then I don't feel like filling my cupboards with comics. I tried the electronic ones - Mad Max not SW - on my iPad but it's not the same. So I prefer the novels. However, I would really love it if they would put drawings of the characters in the novels. Sometimes they describe a specy and I still have a hard time picturing it in my head. So I'd need something in between comics and novels I did buy a Leia comic a couple of weeks ago in the US but it was more as a souvenir. Have not read it yet. I wouldn't mind a couple of illustrations in the novels either.....I would love to see what some of the characters are actually supposed to look like. - Darth Vader's helmet. But everyone seems to think it's something very important and am not sure that the helmet would be worth that much unless Snoke really sees it as a crucial tool to turn Ben and put a heavy bounty on it. 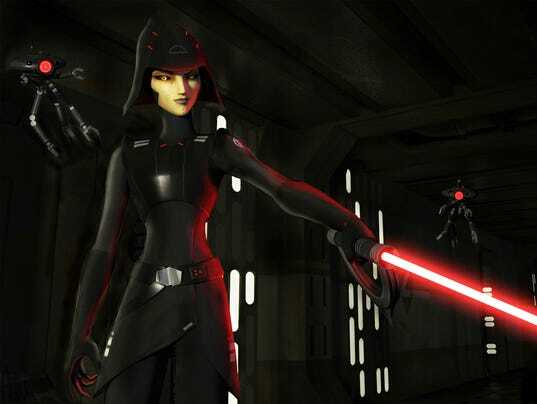 The timeline is not clear, but due to Bazine's appearance, I'd say it's maximum 10 years before TFA. That could fit, but why would a mentally unstable ex-stormtrooper be allowed to keep a case with the helmet? Unless they retrieved and got influenced by it and were then sort of quarantined. - The map to the First Jedi Temple or an indication that Lor San Tekka holds the map. Why would an ex-stormtrooper have that? Why did no one take it from him? I always bump into the obstacle of the timeline - apparently some time after Aftermath and before TFA -, the fact that it's been in the case for some years and some people know about it, and the fact that it must have seemed like nothing while being of utter importance - I don't see how the person who had it would have been allowed to keep it if its value was obvious. - Scramblings that look like the drawings of a mentally ill person but actually represent something. But what? - Something that looks like a toy but is a key to something in the Jedi Temple which is now in the possession of a relic collector. BDT? This collector persona is sticking on him... So only connoisseurs would know the worth of it. That'd be the most viable option because the audience does not need the explanation and just a glimps would make the ones who read the novel happy. I am not very clear in my head today and I am not a good investigator. Bazine would not want me as a partner She does not like partners anyway. In the EU, there is this awesome story of where the lightsaber goes after Bespin...it goes to various random people and the story ends with Ben Skywalker claiming it back to prevent a Snoke like character from misusing it.....I hope that happens in episode 9.